Wonder what goes on at the yard? Menu taken from their facebook page. Click to enlarge. Using plain cups for now. Labeled ones are on the way. How'd I find Tea Serve? While walking around One Mango looking for a place to sit. How'd I find the tea served? After much deliberation and money enough for just one drink, I ordered a 500ml Hazelnut milk tea. To my delight, the drink comes with tapioca pearls! (Yup, I love sago!) Sip. Mmm... hazelnut nga! (If you've read my Macaron vs Macaron post then you know I'm a hazelnut fiend.) This one's good in my book. The tapioca pearls were soft and chewy too, just the way I like it. How come I haven't heard of Tea Serve Cafe before? It has only been around for 3 weeks. 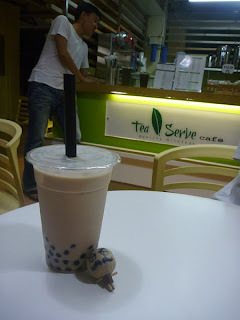 Recommended...by Tea Serve: House blend (with rock salt) and wintermelon milk tea (their bestseller). 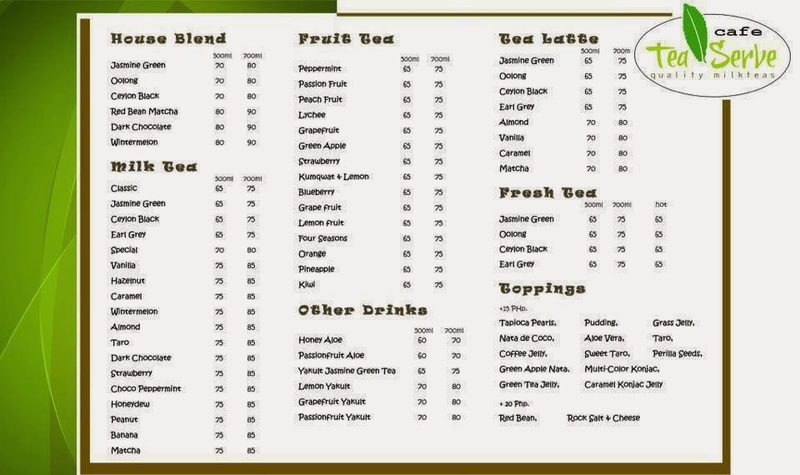 Recommended...by Mustachio: Tea Serve Cafe. Oh yeah. 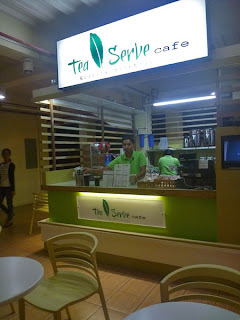 Will come back and try their house blend and wintermelon milk tea. Why didn't I try their recommendations in the first place? I repeat, I'm a hazelnut fiend! We boarded a van for Daet at the gasoline station in Paracale. The van departed from Paracale at around 1:30 pm. Upon arriving in Daet, after a 30-minute drive, we got on a tricycle going to Bagasbas Beach. 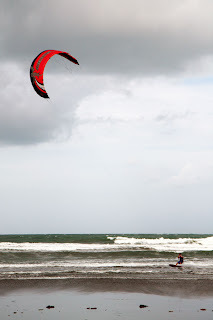 After 10 minutes, we could see people having fun kitesurfing in the area. 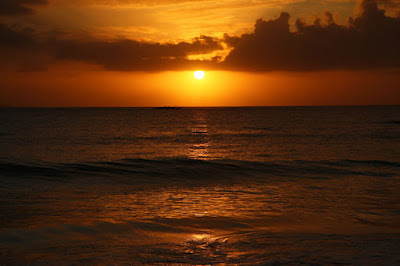 Bagasbas is a long stretch of brown beach, with small to medium waves crashing the shore, and winds blowing endlessly. 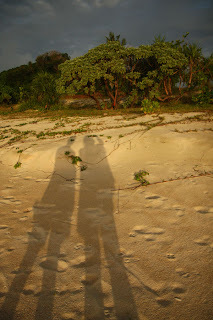 We had to cover our eyes sometimes as the sand would blow on our face once in a while. 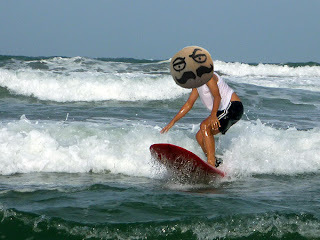 Truth is, the thought of surfing kept floating in my head. Walking along the boulevard, we saw a group of people having a how-to-surf class, and so we stopped to observe them folks. 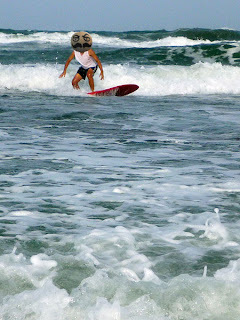 A quirky woman jumped at the chance of asking if we wanted to surf too. We hesitated with dealing with her, thinking she was cashing on us. She introduced herself - Ate Mabel. In the end, we just went with her. Turns out she was the owner of Hangloose Surf Shop. And she was The Most Accomodating Mother Figure in the area. Everyone knows her. The only woman in the picture is Ate Mabel. That's her small surf shop Hangloose. You can rent a surfboard at Hangloose. Ate Mabel was kind enough to keep our belongings safe in her shop, noting that leaving them on the beach attracts crooks. If you're a beginner, it's strongly advised to hire an instructor. Ate Mabel doesn't want any mishaps happening to her clients. So we each had our own instructor. The first minutes, we were taught the basics. 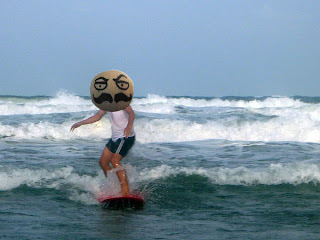 Body centered, feet near the tail of the board, and a quick stand or pop up. 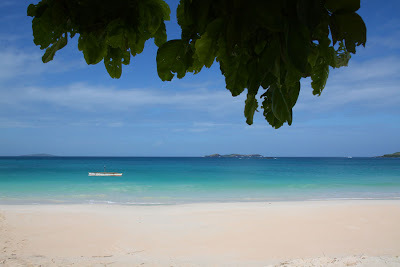 The sea is calling right? No time to waste. Let's hit it! After ten or more failed attempts. 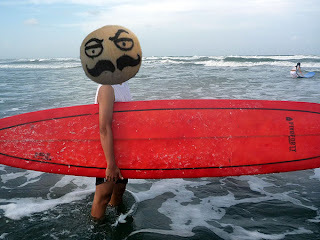 Mustachio's incomplete guide to surfing - I forgot the other steps. 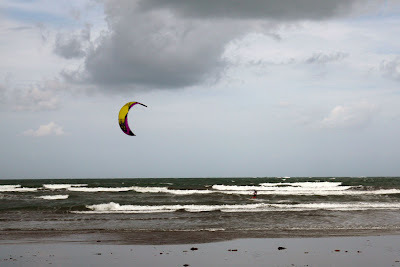 Aside from the sand color and occasional litter, Bagasbas beach, however, has the package for people who want to try surfing. 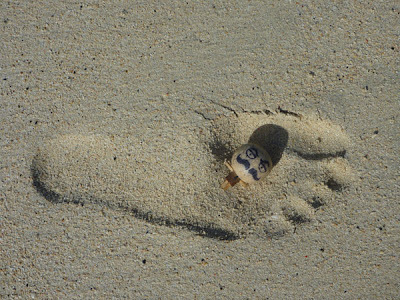 There are no corals or sharp rocks, no fret if you fall off-board, landing is as soft as landing on your bed. 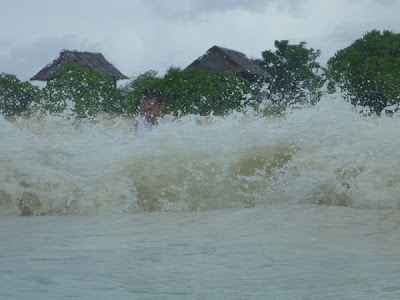 Furthermore, the sea level isn't too deep even at a farther distance from the shoreline. 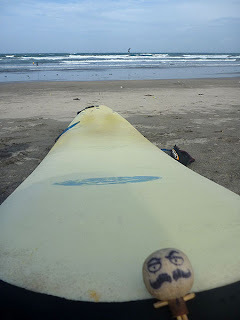 And best of all, the waves hit Bagasbas almost year-round, with the best time coming in during the summer. 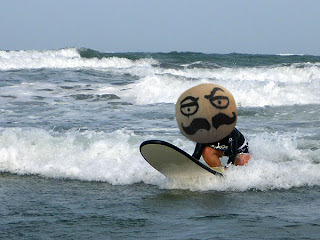 We would have wanted to ride the waves more, unfortunately we had a strict itinerary to follow. 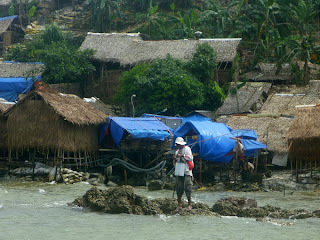 We washed and got changed at the back of Hangloose where the poso (water pump) and a small changing room was located. 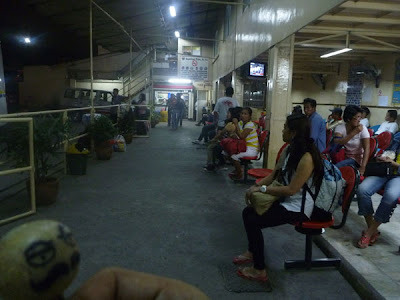 From Bagasbas, we had to ride a tricycle back to the terminal and catch the 6 pm van. On the road again, this time heading to Naga City in Camarines Sur. 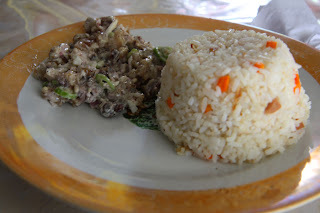 Camarines Sur: Do Not Eat Bicol Express, Ride It! 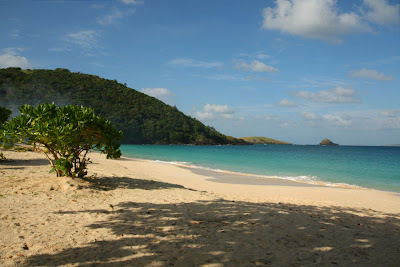 Where is that? 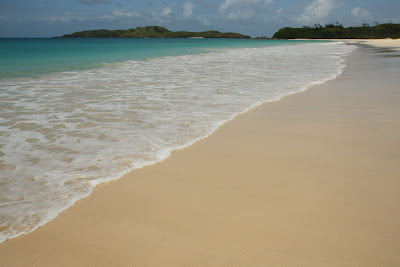 Does Calaguas ring a bell? 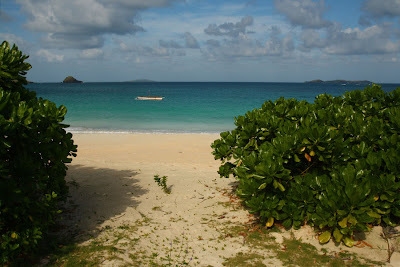 Yep, Tinaga island is one of the many mini-paradise in Camarines Norte's Calaguas group of islands. Day 1. 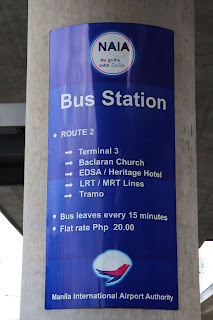 Upon arrival at the airport, we rode the budget friendly shuttle (Php 20) to Taft MRT. 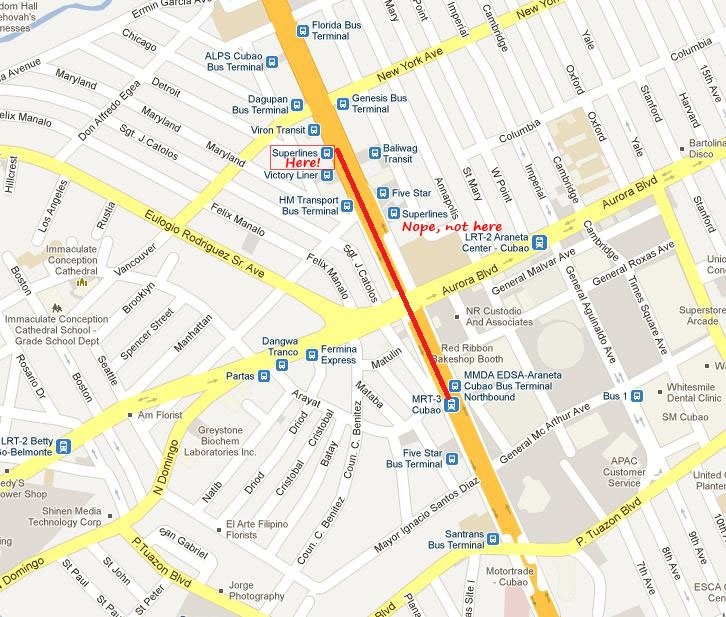 It took us an estimated time of 25 minutes (depends on the traffic) to get to Taft. 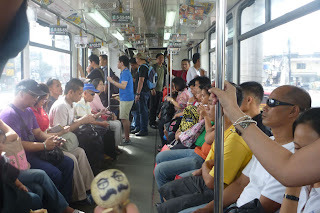 Then we took the MRT to Cubao. 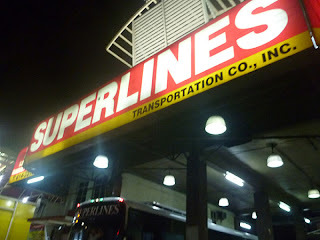 Arriving in Cubao, we asked the guard at the MRT station where Superlines is. Just 2 blocks away. There are two Superlines in the area, the one farther away is where you need to go. It is right after the Victory Liner station. 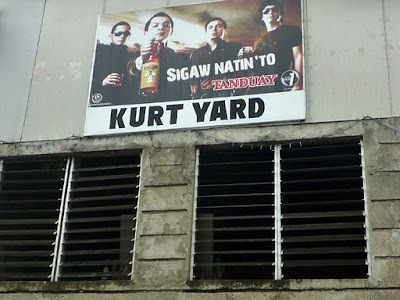 We walked the Cubao street (Epifanio de los Santos Avenue), where caps, sunglasses, shirts ,and all sorts of made-in-China stuff are lined up either from a table, chair, or just along the dusty sidewalk. It's a risk walking at night in this are, especially if you show your bling and expensive gadgets, so keep up the pace and be vigilant. But I needed to stop one time to buy a pari of Php 50 sunglasses that would probably cost twice/thrice back in Cebu. A friend bought 2 pairs of leggings that she haggled from Php 120 to Php 80. 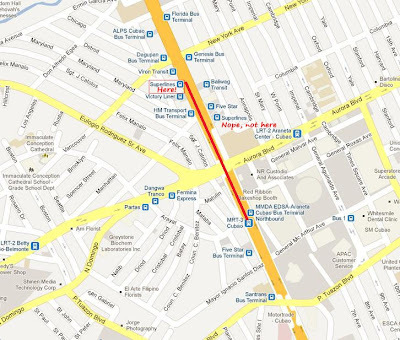 MRT Cubao Stn to Superlines. From google maps. Click to enlarge. We bought our ticket to Paracale at an earlier time, knowing by experience that "you can never be too sure for a sure bus seat". Also, buses for Paracale are limited, so we made the right choice of going early. Two buses leave that night, a non-aircon bus at 8:30 pm and its airconditioned brother at 9:45 pm. We took the latter. 8:40 pm and we were comfortably inside the bus. Street sellers entered the bus every 10 minutes or so, hawking fruits, delicacies, religious stuff and charity envelopes. It was exactly 9:45 pm when we departed from Cubao. The bus ride was 9 sleepy hours. Day 2. We arrived almost 7 am and stopped at a gasoline station in Paracale. 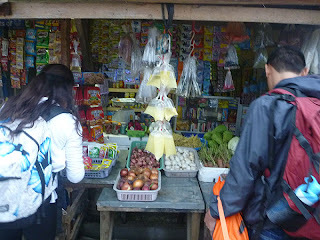 It was still a cold early morning so we bought cooking ingredients in the market, a 5-minute walk from the gas station. 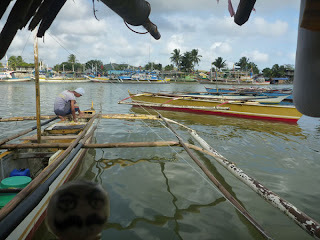 The boat was waiting for us in Brgy. Palanas, a 5-minute tricycle ride from the marketplace. Brgy. Palanas is famous, or should I say, infamous for its Gold mines. The mines have brought wealth and, unfortunately, a number of undocumented accidents and deaths to locals trying to mine Palanas' hills of deep gold. A sleepy Ate Grace met us at the waiting shed and told us that the boat was still at sea and was going to be back in an hour. 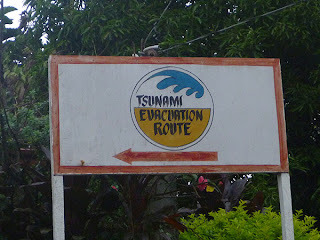 She did not expect us to be there, since a tropical depression was building on parts of Bicol region that time. She said another group cancelled after hearing the news. 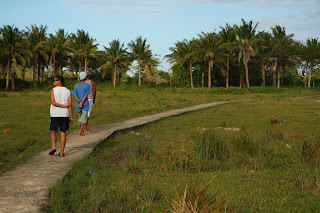 It turned out we were the only group going to Tinaga island that day. 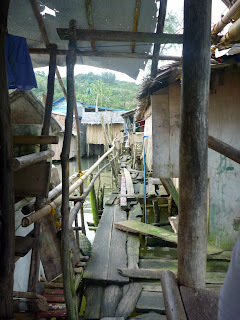 Anyway, she invited us to her house and we treaded on small walkways with long stilts that elevated the neighborhood above the sea. We spent our one hour hiatus looking for a place to fill our stomachs. 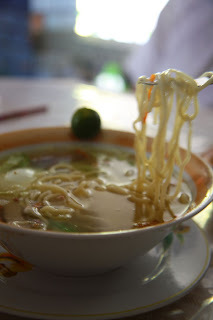 I remembered a restaurant on our way to Brgy. Palanas that looked a lot like McDonald's. A minute of retracing our steps and voila! 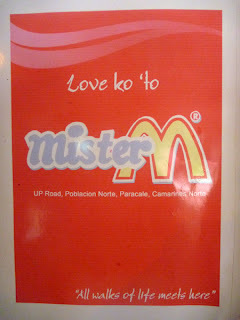 Mister M restaurant. ... now where have I heard this before? Back with satisfied stomachs, we were met with the sight of our pumpboat just outside the makeshift waiting lounge. 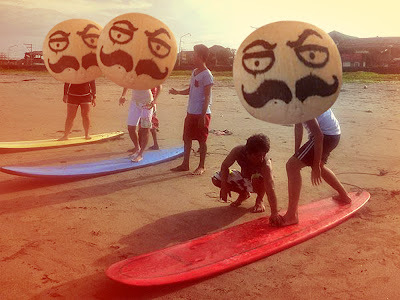 Ate Grace's husband, Kuya Rodel, was El Capitan, while El Capitan's assistant was John Louie. They assisted us in boarding the boat, loading some of our heavy bags, and making sure the bags were covered and waterproofed. Also, the boat was equipped with life vests. They knew how the ride was going to be. 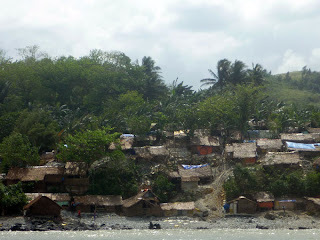 One thing you need to know about the small- to medium-sized pumpboats in Brgy. Palanas - they don't have roofs or sun covers. The covers will only drag the boat away in case a strong wind blows. So make sure you don't get fried to a crisp when being under the sun for two or more hours. We started our voyage at around 8 am. Our way to Tinaga island isn't what anyone could call "smooth sailing". The sea was rough and wavy. 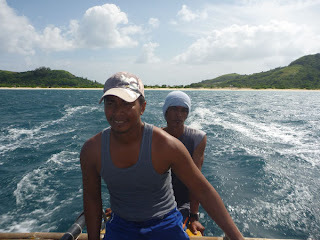 Kuya Rodel, with his calm look, had to accelerate or decelerate the boat in order to go with the flow. By experience he knows what to do in these situations. But fret not coz these does not happen all year round. 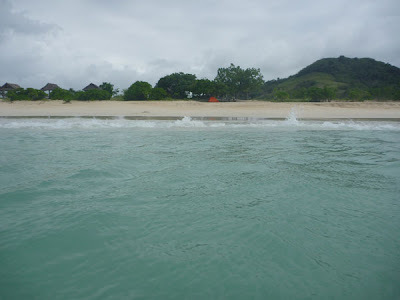 The sea is mostly fair sailing during the summer season. From google maps. Click to enlarge. Sun, sea, and waves. WAVES! 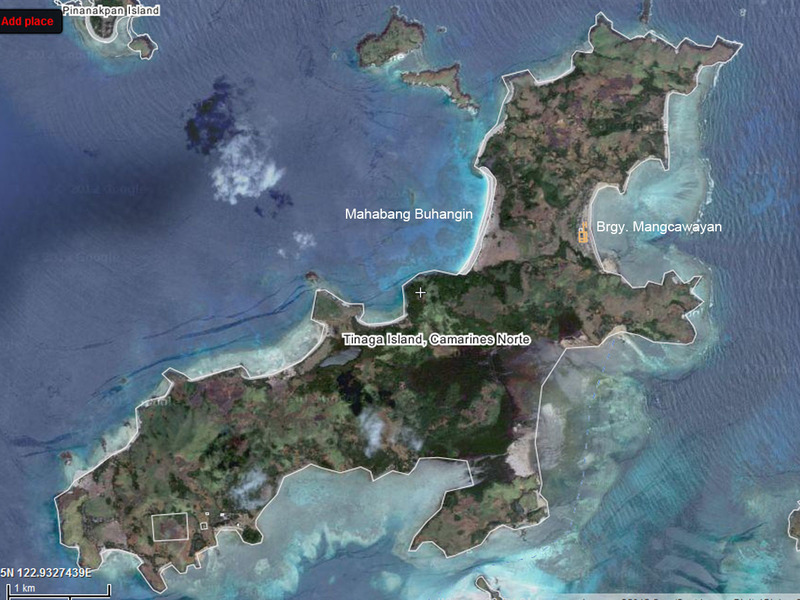 After a two-hour rollercoaster ride, we safely arrive in Tinaga Island's Mahabang Buhangin. Mahabang Buhangin is pretty much a beach bum's dream destination: laidback, peaceful, and a breathtaking view everywhere you look. Lucky for us, the beach was all for our taking. 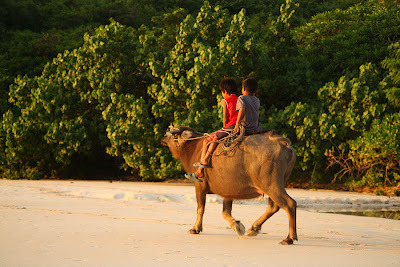 Aside from the locals, the three of us were the only travelers on the island. Welcome to paradise, mi amigo! 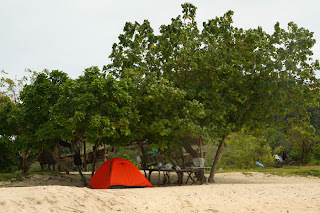 Tents are the standards here since there are no resthouses in Mahabang Buhangin. 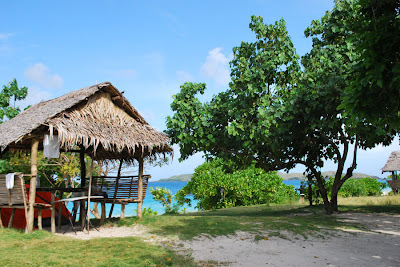 They do have cottages that you could rent for php150 overnight. We cooked our lunch at an earlier time since we wanted to enjoy the beach more. There is no electricity in the area. So it would be better to do the important stuff while the sun is up. 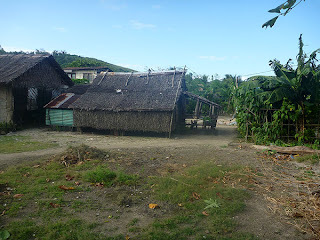 Water is available in Tinaga island, but just to be safe, bring your own supply of drinking water. 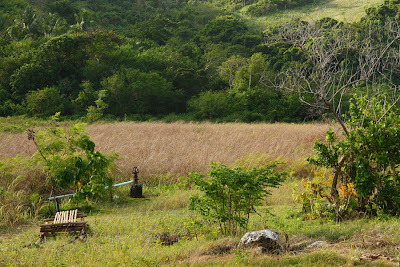 The nearest fresh water comes from a pump near the cottages. Also, a toilet has been constructed in the area so you don't have to worry about doing it in the bushes. 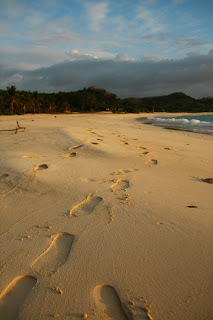 Aside from relaxing by the beach, we hiked to where the nearest village, Brgy. 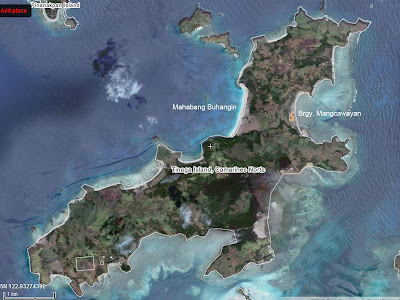 Mangcawayan, is. They have a store where you can buy salt, matches, eggs, some types of fish, and spices; if you forget to buy some back on the mainland, this might be the best place to get them. 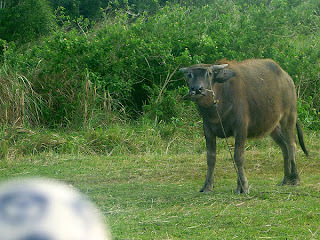 It's a 15-minute leisurely walk with sights of tall grass, coconut trees, and carabaos. The wind blew nicely on the hills' long grass which made them look like that of a shaggy dog's fur. From wikimapia. Click to enlarge. 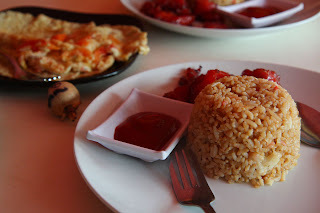 It was already 4pm and we still had to cook our dinner, so we went back to Mahabang Buhangin before it got dark. It did rain that night, so we ended up putting our tent a quarter inside a cottage, while the ever helpful caretaker, Kuya Arnold, had to wrap a tarp around the cottage to protect us from the rain and wind. But despite all that, we all slept comfortably in our tent. It was lovely waking up to the sound of the waves. 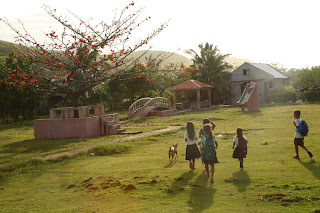 It's 10 am and after plenty of photos, we packed up and headed back to Brgy. Palanas. 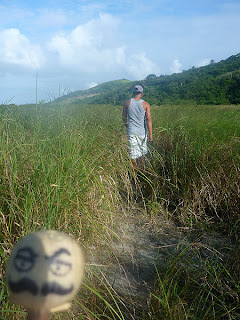 Nearing Brgy Palanas. Palanas hill and the miners' shanties on the right. 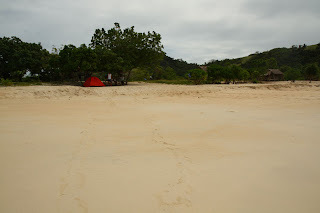 Mahabang Buhangin is the best beach I've been to so far. The pictures do not do any justice to how nice the place is. I think it's also the peace and quiet, plus the scenic view, that made it an excellent place to relax. 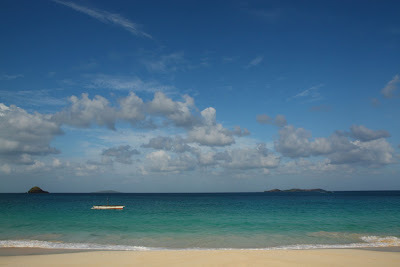 But since Calaguas is no longer a hidden destination, the place has been getting crowded. 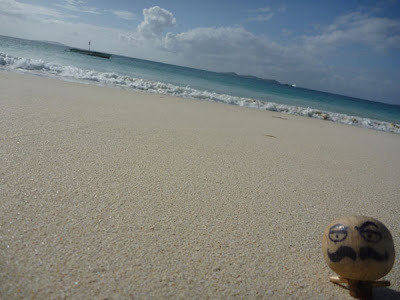 Many would flock the island during weekends, summer breaks, and holidays. We were very lucky though to have the place for ourselves. 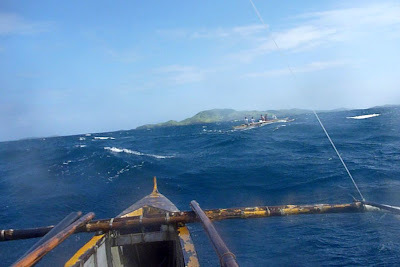 The boat ride back to Brgy. Palanas was now less rough. It took only an hour and a half to reach Kuya Rodel's house. Back there we washed up and chatted a little with the family. We said our thank yous, waved goodbye, then headed back to Paracale. 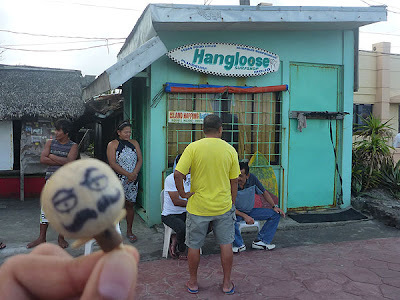 We walked the street leading to Mister M, but on the way we decided to eat at the El Minero Snack House for a change. Time check: 1 pm. According to our itinerary, we had to get to Paracale's gas station to catch the V-hire (van) going to Daet. 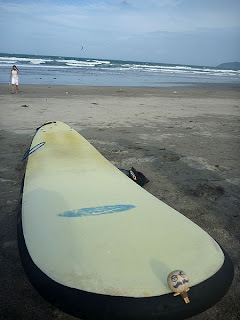 Yep, after the island bumming, it's time to surf the waves of Daet. There is no electricity in the island. Bring flashlights and spare batteries. Fully charge your gadgets before leaving Brgy. Palanas. Networks available in Paracale are Smart and Globe. 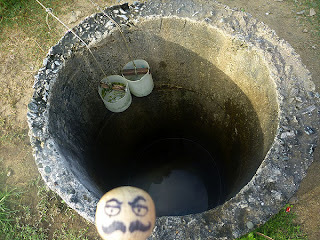 In Tinaga island, Smart only. Water is available but it is best to bring your own drinking water. At least 2L per person. Food and cooking supplies can be bought at the market in Paracale. Greet the locals and always be courteous. This generally goes a long way. Respect the island. Never litter. Properly dispose your trash. No shouting or cussing. 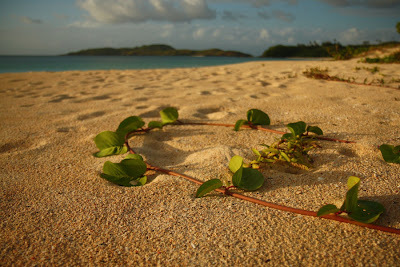 Keep the island's peacefulness at all times.